An Iraqi religious leader has laid a foundation stone for the rebuilding of Mosul’s Great Mosque of al-Nuri, which was damaged by Islamic State militants. The head of the Sunni Muslim Endowment, Abdul Latif al-Humayim, was joined by UN and EU dignitaries for the ceremony. The mosque, whose leaning minaret was one of Mosul’s most famous landmarks, is where IS leader Abu Bakr al-Baghdadi proclaimed a “caliphate” in 2014. The jihadist group blew it up last year as government forces retook the city. The battle for Mosul lasted almost nine months, left large areas in ruins, killed thousands of civilians and displaced more than 900,000 others. 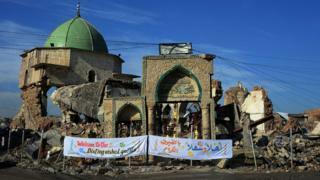 The Iraq representative of the UN’s cultural agency, Unesco, told those attending the ceremony on Sunday that the Great Mosque of al-Nuri’s destruction had been “a moment of horror and despair”. “Today, as we lay the foundation stone… we are starting a journey of physical reconstruction,” Louise Haxthausen added. The United Arab Emirates has donated $50m (£40m) for the project, which is expected to take five years. The first year will be focused on documenting and clearing the site. The next four years will see the rebuilding of the minaret, the prayer hall, and adjacent buildings. Mosul’s historic gardens and other open spaces will also be restored, and a memorial and museum built. The Great Mosque was named after Nur al-Din Mahmoud Zangi – famous for mobilising and unifying Muslim forces to wage jihad against the Christian Crusaders – who ordered its construction in 1172, shortly before his death. Despite its connection to such a figure, all that remained of the original mosque until June 2017 was its minaret – nicknamed “al-Hadba”, or “the humpback” – some columns and the mihrab, a niche indicating the direction of Mecca. It is not clear whether the minaret will be rebuilt with its distinctive lean – Unesco calculated in 2012 that it was 2.5m (8.3ft) off the perpendicular axis.